For the first time, the Los Angeles County Parks and Recreation’s award-winning Parks After Dark (PAD) will be offered during Spring Break. 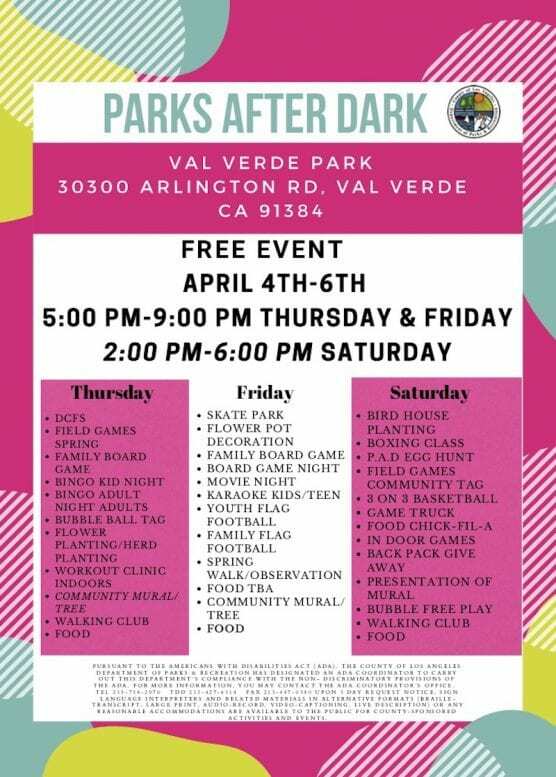 PAD provides recreational and social opportunities for youth and families during extended evening hours at various parks across Los Angeles County, including Val Verde Park, which is located at 30300 Arlington Road, Val Verde, 91384. Activities will vary depending on the park. Programming includes color runs, cooking classes, basketball clinics, senior bingo, boxing, and evening painting. Sessions are available for all ages, including toddlers, children, youth, young adults, families, and seniors. Thursdays and Fridays, 5:00 p.m. – 9:00 p.m.
Saturdays, 2:00 p.m. – 6:00 p.m.
Spring Parks After Dark will take place at 33 Los Angeles County Parks. For participating parks, click here.